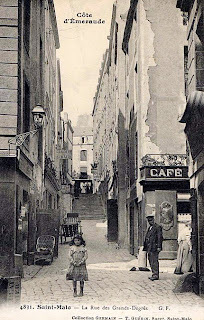 Rue des Grands-Degrés owes its name to its steep gradient, which made it necessary to put in steps (degrés in French). 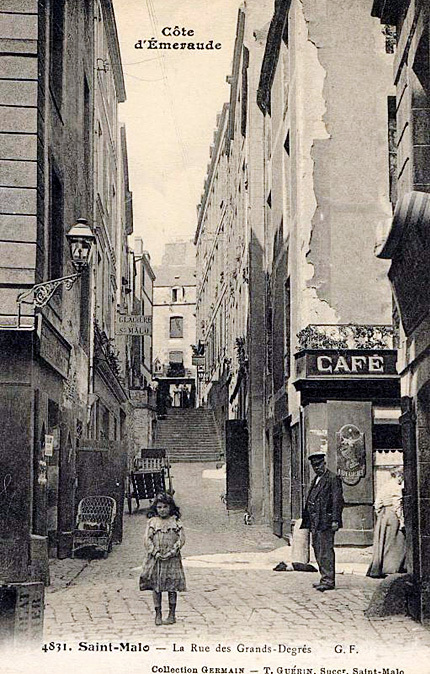 Likewise, the Rue des Petits-Degrés and the Rue du Puits aux Braies were designed the same way. No. 17, which was built in 1700, is the former town-house of the corsair captain and ship-owner François Le Fer, Sieur du Pin, who was the Mayor of Saint-Malo from 1708 to 1710. Its interior was totally destroyed in August 1944, but its façades were rebuilt exactly the way they were before. This town-house had a sumptuous interior; in particular a sitting room with mahogany panelling, where the marriage of François-René de Chateaubriand (Saint-Malo 1768 - Paris 1848) to Céleste Buisson de la Vigne (Lorient 1774 - Paris 1847), a friend of Lucile de Chateaubriand (Saint-Malo 1764 - Paris 1804), the writer’s fourth sister, was celebrated in secret on 21 February 1792. However, as the marriage had been blessed by a priest who rejected the oath concerning the Civil Constitution of the Clergy (introduced as a result of the French Revolution), one of the young wife’s uncles considered this marriage to be contrary to the laws of the French Republic. Céleste Buisson de la Vigne was shut up in a nunnery called the Couvent de la Victoire until such time as a second ceremony could be celebrated a few days later before the parish’s constitutionally-recognised priest. Numbers 7, 13, 15 and 15 B also date from the early 18th century. Number 2 bears the date 1615.